Hello all, I ma back today with my third card using Simon Says Stamp October Card Kit. This card has very little stamping on it and uses the gorgeous pattern papers, journalling card and dies from the kit. The kit is beautifully coordinated so it is easier to pick a pattern paper and coordinating journalling card to layer over the pattern paper with a vellum overlay. On this card, I chose the typewriter pattern paper with random gold foiled typewriter on it. 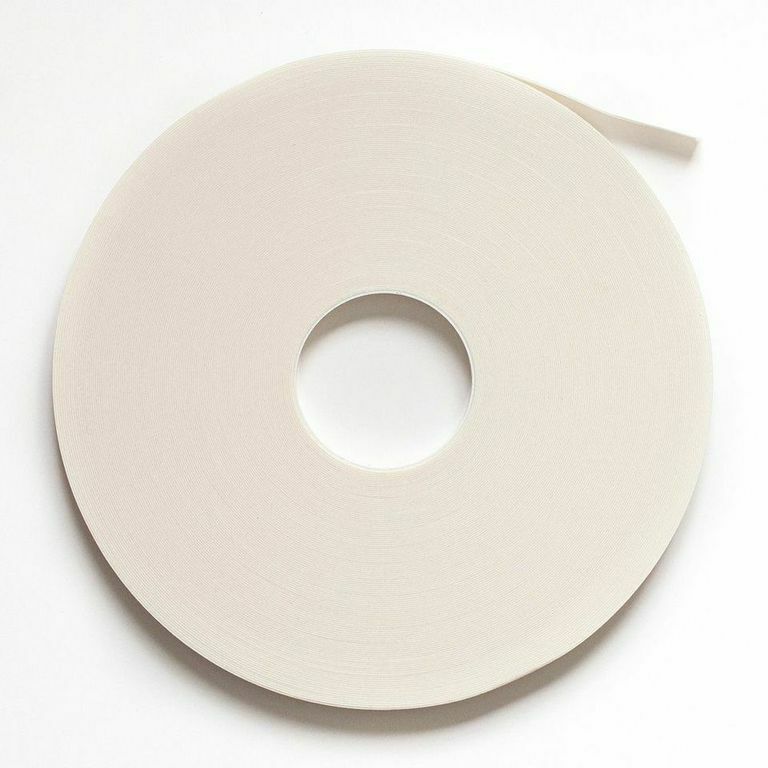 I adhered this pattern paper on a cream card base using the cream cardstock from the kit. I trimmed the typewriter from the journalling card to foam mount over a vellum overlay. 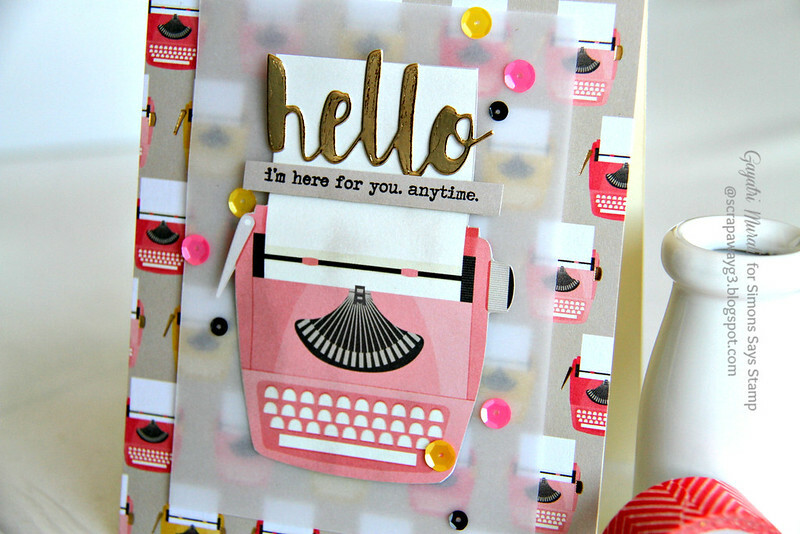 Then die cut the big sentiment using the Hello die from the kit using gold foil cardstock and stamp the smaller sentiment on to strip of cream cardstock also from the kit. Finally embellishing with Pretty Pink Posh Orchid, Lemon Drop and Charcoal sequins. Very easy to make because the kit is well coordinated. That is why I love kits. It takes away the time I spend on coordinating pattern papers, colours, stamp set, embellishments. A big time saver. I will share couple of more cards later using the butterfly and spectacles pattern paper and journalling card using the similar process. If you like to see my first and second card, they are HERE and HERE! 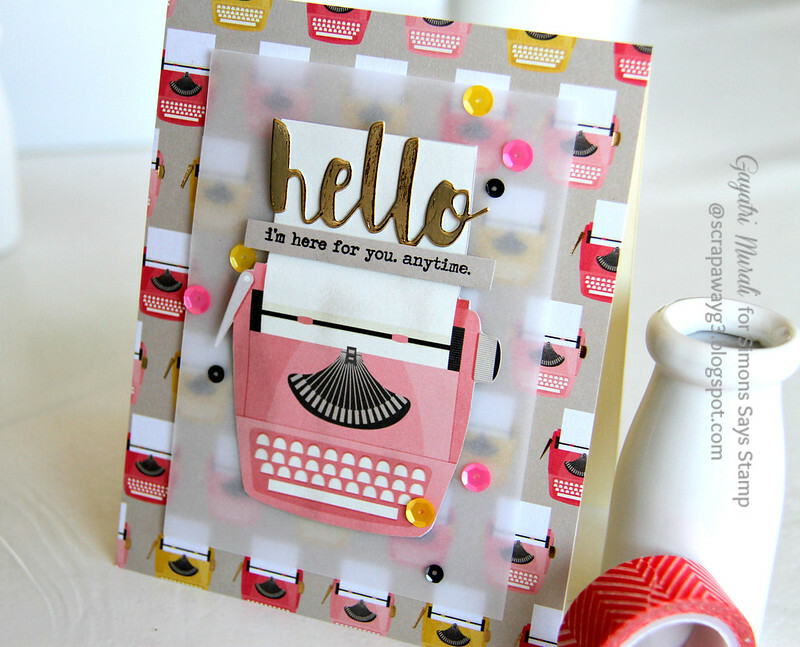 More inspiration using the card kit is HERE!